Forty years after Richard Nixon resigned the presidency, Watergate still resonates as one of the worst political scandals in our country’s history. For most people, the name evokes the June 17, 1972, break-in at the Democratic National Committee headquarters in the Watergate complex in Washington and the cover-up, in which, as became clear later, the president himself had an immediate and central role. 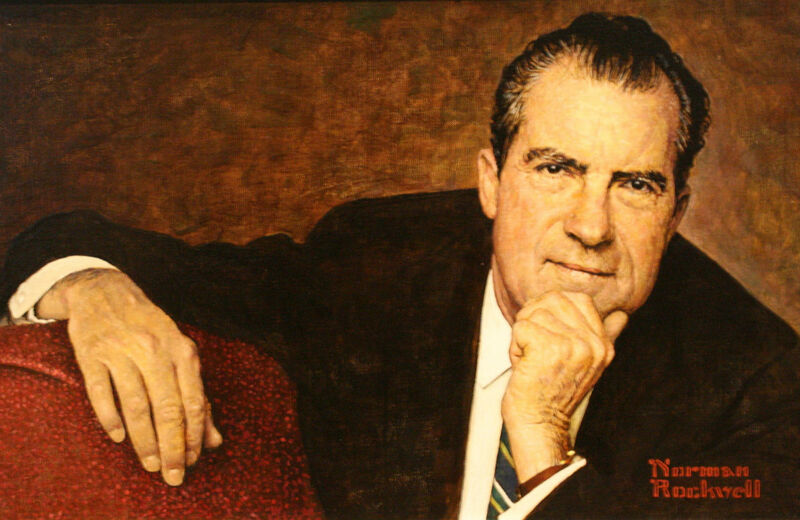 The break-in was not a “third-rate burglary,” as Nixon’s spokesman tried to convince us, but a major assault on the electoral process; nor was the cover-up limited to rogue White House aides, as Nixon eventually claimed; it was a brazen, widespread obstruction of justice that set a precedent for later abuses of power by other presidents. President Nixon used the powers of his office to hide the involvement in the burglary of top campaign and White House officials. He promised presidential pardons to the burglars and directed that campaign funds be used to buy their silence. He ordered the CIA to stop the FBI’s investigation. He suborned perjury by his top staff and obtained secret grand jury information to coach prospective witnesses. The cover-up worked disturbingly well through the presidential election—Nixon won by a landslide—and into early 1973. But Watergate is also shorthand for a whole catalog of other abuses and crimes committed by President Nixon. In an effort to obtain discrediting information about Pentagon Papers leaker Daniel Ellsberg, Nixon approved a break-in at Ellsberg’s psychiatrist’s office. He created the infamous “enemies list” of antiwar activists, political opponents and journalists—including The Nation’s White House correspondent Robert Sherrill—who were to be subjected to harassing Internal Revenue Service audits. He ordered illegal wiretaps of journalists and White House staffers, which continued, conveniently, even after one of them went to work for a Democratic presidential opponent. He directed the secret bombing of Cambodia, a neutral country, and concealed the fact from Congress and the American people. He refused to spend funds lawfully appropriated and tried to dismantle a federal agency, the Office of Equal Opportunity, which had been tasked with implementing much of President Lyndon Johnson’s War on Poverty agenda. Simply put, President Nixon placed himself above the law. In a television interview with David Frost after he left the White House, Nixon explained: “When the President does it, that means that it is not illegal.” These are the words of someone to whom nothing is forbidden. This is the philosophy of a despot, not of a president in a democracy. to read it instantly on your tablet, eReader, smartphone or computer. In my first term in the House of Representatives, I served on the Judiciary Committee, which in the spring of 1973 conducted impeachment proceedings against the president. It was clear to me that the bipartisanship and the seriousness with which the committee approached its task were motivated by a sense of the grave danger Nixon posed to the rule of law. Watergate is often blamed for engendering deep public cynicism about government. But as I saw from my front-row seat in Congress, Watergate actually showed that our constitutional system of checks and balances can, in fact, work. While the president engaged in crimes and abuses of power—something our constitutional framers anticipated some president, someday would do—the press, the courts and Congress blocked him and forced him out of office. The rule of law, although battered, won out—briefly, at least. Let’s look at this record. A courageous conservative Republican judge, John Sirica, smelling something fishy when all the Watergate burglars pleaded guilty, imposed very long sentences on them, hoping one would break down and tell the truth. The one who did—James McCord—admitted that higher-ups were pressuring the defendants into silence. That cracked open the cover-up. In May 1973, the Senate forced attorney general nominee Elliott Richardson—in exchange for confirmation—to appoint a special Watergate prosecutor so as to ensure an investigation independent of Nixon’s control. The Senate also created a special committee to investigate Watergate, headed by Senator Sam Ervin, which uncovered the White House taping system and exposed many details of the scandal to a riveted public. In October of that year, when President Nixon ordered Special Prosecutor Archibald Cox fired for trying to subpoena the White House tapes (in what was called the Saturday Night Massacre because it prompted the attorney general and other Justice Department officials to resign in protest), the American people had finally had enough and in vast numbers began to call for congressional action. That triggered the impeachment proceedings. When President Nixon wanted to keep his tape recordings from the Watergate grand jury, the Supreme Court, several of whose members had been appointed by him, unanimously rejected his request. The “smoking gun” tape, in which the president orders the blocking of the FBI investigation, became public. The House Judiciary Committee voted for three articles of impeachment in July 1974 after months of painstaking deliberations. The rest of the Republican members announced their support for impeachment after the “smoking gun” tape became public, making the committee’s verdict unanimous. When President Nixon became the first to resign his office, he did this knowing that if he tried to stay on he would certainly be impeached by the House of Representatives and removed from office by the Senate. Point, counterpoint. Check, checkmate. That is the story of Watergate. Smoking Gun: The Nation on Watergate, 1952–2010 brings the entire progression of events sharply to life. From the June 1972 break-in to Nixon’s resignation and beyond, we see a country trying to sort out what kind of government it wants. Issued before any prosecution of Nixon had commenced, and without any acknowledgment of guilt on Nixon’s part, Ford’s pardon created a dual system of justice—one for ordinary Americans and another for the president. (Ford’s excuse that Nixon had “suffered enough” could have been applied, of course, to any person whose criminal activities had been exposed.) Unlike its persistence in tackling Watergate, Congress backed away from any serious investigation of the pardon. We will thus probably never know whether Nixon and his lieutenant Ford made a secret deal over the pardon—in which Nixon would resign promptly and Ford would pardon him, not only shielding the president from prosecution, but limiting the Republican Party’s electoral losses at the polls in November. Download the new e-book Smoking Gun: The Nation on Watergate, a unique real-time history of the rise and fall of Richard Nixon and the consequences for American democracy, to read it instantly on your tablet, e-reader, smartphone or computer. It is also available as a paperback.